Radio and plasma wave instruments in space can detect cosmic dust over a wide range of sizes via impact ionisation. Such measurements were performed on a number of spacecraft in various environments, using instruments that were generally not designed to do so, and have been recently extended to nanodust. The technique is based on analysis of the electric pulses induced by the plasma clouds produced by impact ionisation of fast dust particles. Nanodust can be detected in this way despite their small mass because (1) their large charge-to-mass ratio enables them to be accelerated to high speeds, and (2) the amplitude of the induced electric pulses increases much faster with speed than with mass. As a result, the impacts of nanodust produce signals as high as those of larger and slower grains. 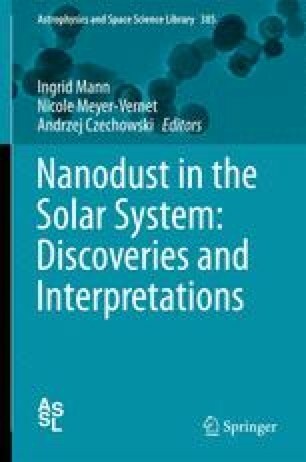 This chapter describes the basic principles of such measurements, the underlying physics, the applications to the recent discovery of interplanetary nanodust near Earth orbit with STEREO/WAVES, and to the detection of Jovian nanodust with Cassini/RPWS. Finally, we give some perspectives for wave instruments as dust detectors.